Home » animation , movies , posters , the adventures of tintin , trailers » The teaser and first posters for THE ADVENTURES OF TINTIN: SECRET OF THE UNICORN! 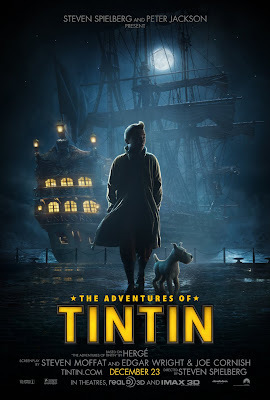 The teaser and first posters for THE ADVENTURES OF TINTIN: SECRET OF THE UNICORN! As of this writing I'm in the midst of an emergency that has me... well, occupied, to put it mildly. Can't say enough how thankful my family is for the thoughts and prayers that a lot of people have been sending. And that's all I should say for the time being. But I've a dire need to post something upbeat. And all two of my readers (okay there's more than that, and this blogger appreciates every one of you who takes time to read The Knight Shift on a regular basis :-) deserve something uber-kewl to tide y'all over until I get back to regular postin'. So let me preface this by saying thusly, that you heard it here first: this movie will make a billion dollars at the box office. At least. I told my friend Bennie in '93 that Tintin would make an awesome movie. I've been waiting for that to happen ever since. Well, coming this Christmas to movie theaters everywhere, it's The Adventures of Tintin: Secret of the Unicorn. Directed by... Steven Spielberg (it's his first time ever directing a CGI film)! Produced by... Peter Jackson! The screenplay by... Steven Moffat and Edgar Wright and Joe Cornish! Orchestral score by... John Williams! Starring... Jamie Bell, Andy Serkis, Simon Pegg, Nick Frost, Cary Elwes, and Daniel Craig! Among many others! Holy Toledo. Just seeing Spielberg's and Jackson's and Williams' and Moffat's (currently the showrunner of Doctor Who) together like that alone gives me geek cardiac infarction. Click on it to drastically embiggenize. That is... totally Tintin and Snowy. The darkness and ambiance of this image, is spot-on the world of Tintin. BUT THAT'S NOT ALL!!! Now behold the first teaser trailer that got released yesterday. Is this not the most GLORIOUS computer-generated animated EVER or what?!? Can not, can not, CAN NOT wait until Christmas! This is going to be epic on a generational scale. I'm looking forward to it as well!